A green carbon cure to heal our blue planet. Let’s name the problem: fossil carbon and the insidious damage it’s doing to the air we breathe, the water we drink, the oceans we fish, and the climate we depend on for our lives and livelihoods. Worse, cheap fossil carbon is addictive. New Energy Blue is the clean energy producer that has created a green carbon cure to replace petroleum-based products at a substantial profit. After ten years of investment, innovations, and optimization, we’ve put together the right team and technologies. Our international specialists have been drawn from essential disciplines across the industry. We’ve turned a proven Danish process into a sound business model for the Americas that stands ready to seize a significant niche in the renewable energy and biochemical sectors. 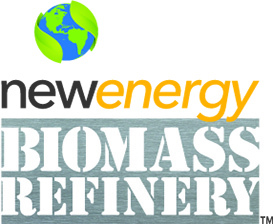 Our sustainable factories, New Energy Biomass Refineries™, are designed to replace fossil carbon in a variety of renewable downstream products: transportation fuels, electricity, plastics, carbon fiber, cosmetics, paint thinners—almost anything now made from a barrel of oil. In harmony with the seasons and nature’s carbon cycle, we will convert agricultural wastes like straws, corn stalks, and sugarcane stems and leaves into higher-value, higher-profit energy for low-carbon markets. Our current intent is to meet the annual billion-gallon demand of the California market to replace conventional ethanol made from grain with ultra-low-carbon fuel made from nature’s wastes. With this strategy, New Energy Blue plans to deploy over a billion dollars of capital over the next five years to develop, own and operate our proprietary refineries, creating green tech jobs, strengthening America’s farmer communities by reducing her carbon footprint. It’s what planet healing should look like.